Low- and middle-income countries (LMICs) account for as much as 85% of the world population and over 90% of the global burden of disease, and mostly count on international donor funding for health, the average domestic health expenditure being lower than 12% (Figure 1). Although there has been a dramatic increase in public health expenditure in many resource-constrained countries, this is still largely insufficient to meet current and future needs. 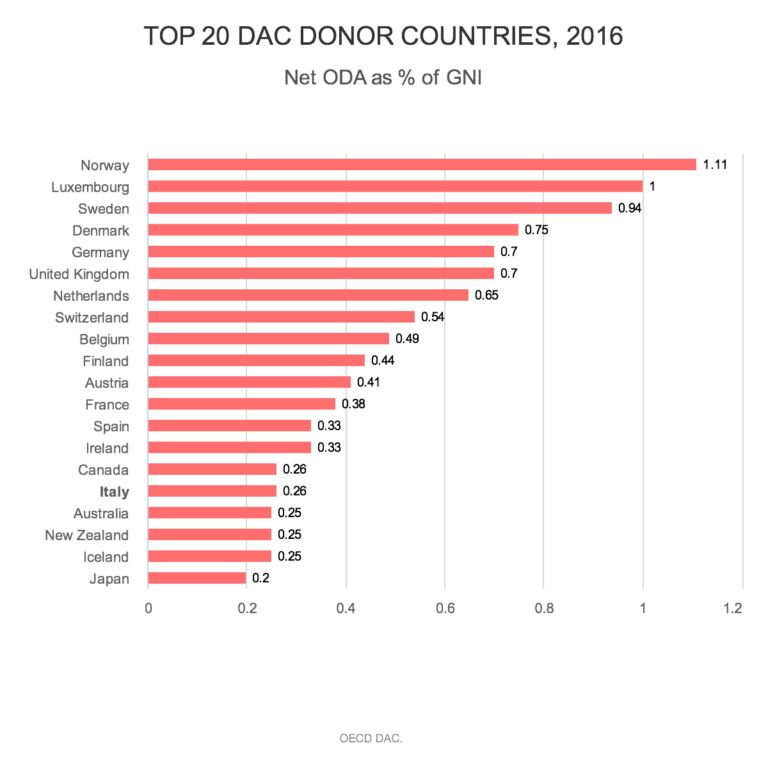 The United States and United Kingdom are the most generous donor governments and a growing proportion of global health financing now comes from private actors (the Bill & Melinda Gates Foundation above all). With the launch of the Millennium Development Goals (MDGs) and the foundation of the Global Fund to fight AIDS, Tuberculosis and Malaria (GFTAM) in 2001, the international community set a target of 0.7% of gross national income (GNI) to foster health financing from high-income countries. This notwithstanding, many high income countries are yet to meet this goal, leaving a tremendous gap between the available funds and the estimated needs. According to the latest data from the Organization for Economic Cooperation and Development (OECD) in 2016, Italy’s contribution to international aid (the so-called ODA, official development assistance) amounted to only US$4.9 billion (of which about one third was aimed to cover in-country costs for refugees), corresponding to approximately 0.26% of its GNI (Figure 2). Despite a slowly rising trend compared to the previous few years, Italy’s contribution remains a negligible sum for a country that sits at the G7 table. As an Italian citizen, I feel particularly disappointed that my country is not stepping up as a global player. So why is Italy so parsimonious when it comes to global health funding? The reasons for such a limited financial contribution to global health are numerous. Among them is a tendency to only allocate substantial resources in times of crises and very little during periods of stability. This suggests that our political leaders care more about looking good during crises but care little about long-term development. Most health investments need a longer time horizon to succeed, and achievements may be hard if not impossible without adequate planning and financing. The recent economic crisis may have played an important role in determining the extent of Italian commitment for global health assistance, leading to a further reduction in international funding down to a nadir in 2012. However, disproportionately devoting financial efforts to internal affairs rather than to international ones looks to be quite a common practice, and Italy is not the only country to do this. This may at least in part be explained by the complex socio-economic scenario that has characterized the country for a long time, starting from the well-known serious menace represented by organized crime infiltrating its deepest roots, not to forget the plague of massive tax evasion, widespread corruption and waste of resources across public institutions that keep challenging the national treasury. This reflects a largely self-centred vision of the world. Like it or not, we are all interdependent and strongly interconnected beyond any borders. No matters how high the walls that we build between each other, diseases and their determinants will always be able to cross them. How can we expect to eliminate tuberculosis, for example, within a couple of decades if just US$6.4 billion of the needed US$8 billion are annually allocated for routine diagnosis and treatment, and if only one third of the estimated required funding for research and development between 2011 and 2015 were actually available? How can we hope to end the AIDS epidemic without raising the current US$19 billion funding to over US$26 billion by 2020? And how can we keep the pace with the global eradication of malaria if we currently fall short below 50% of the required investments? Yet these are only a few of the resources we urgently need to address the major health threats throughout the world. Engaging in bold, long-term investments for global health would mean taking a step forward to meet the ambitious Sustainable Development Goals(SDGs) and Italy should take up a leading role towards it globally. Originally published on BMJ Blogs.